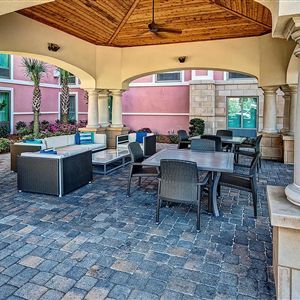 Property Location A stay at Hampton Inn & Suites Destin places you in the heart of Destin, steps from Big Kahuna's Water and Adventure Park and close to The Track Family Recreation Center. This hotel is within close proximity of Morgan Sports Center and Indian Bayou Golf Club. Rooms Make yourself at home in one of the 130 air-conditioned rooms featuring refrigerators and microwaves. 40-inch flat-screen televisions with premium TV channels provide entertainment, while complimentary wireless Internet access keeps you connected. Private bathrooms with shower/tub combinations feature complimentary toiletries and hair dryers. Conveniences include desks and coffee/tea makers, and housekeeping is provided daily. Amenities Take advantage of recreation opportunities including an outdoor pool and a fitness center. Additional amenities at this hotel include complimentary wireless Internet access, tour/ticket assistance, and a picnic area. Dining A complimentary hot/cold buffet breakfast is included. Business, Other Amenities Featured amenities include a 24-hour business center, express check-out, and dry cleaning/laundry services. Planning an event in Destin? This hotel has facilities measuring 504 square feet (45 square meters), including a meeting room. Free self parking is available onsite. 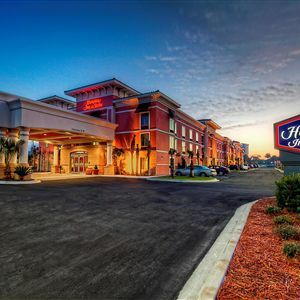 A stay at Hampton Inn & Suites Destin places you in the heart of Destin, steps from Big Kahuna's Water and Adventure Park and close to The Track Family Recreation Center. This hotel is within close proximity of Morgan Sports Center and Indian Bayou Golf Club. Make yourself at home in one of the 130 air-conditioned rooms featuring refrigerators and microwaves. 40-inch flat-screen televisions with premium TV channels provide entertainment, while complimentary wireless Internet access keeps you connected. Private bathrooms with shower/tub combinations feature complimentary toiletries and hair dryers. Conveniences include desks and coffee/tea makers, and housekeeping is provided daily. Take advantage of recreation opportunities including an outdoor pool and a fitness center. Additional amenities at this hotel include complimentary wireless Internet access, tour/ticket assistance, and a picnic area. Featured amenities include a 24-hour business center, express check-out, and dry cleaning/laundry services. Planning an event in Destin? This hotel has facilities measuring 504 square feet (45 square meters), including a meeting room. Free self parking is available onsite.